More than ever, professional post-production facilities, independent editors, colorists, and cinematographers are requiring solutions capable of being portable for on set applications such as dailies or screenings. Don’t get left behind. If it’s not in your budget to deploy a state-of-the-art digital intermediate workstation, then you need to check out the ExtremeStor Transport. 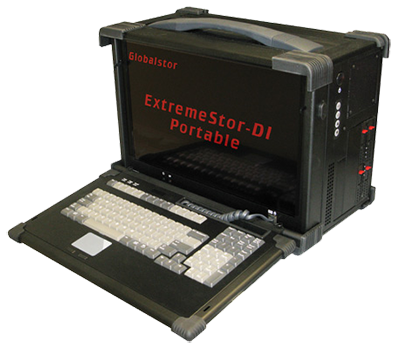 The ExtremeStor Transport delivers the same robust architecture you have come to expect from Globalstor’s ExtremeStor-DI workstations, with one major caveat… The ExtremeStor Transport is compact and portable! The ExtremeStor Transport features a 17” high resolution 1920×1080 display, up to 7 PCI-E x 16 slots capable of running the latest most popular add on cards. Not only does it feature PNY Quadro Professional Graphics with optional SDI outputs, but optional dual Red Digital Cinema RED Rocket cards can be integrated for seamless stereoscopic Red R3D playback. Additionally, an optional Solid State Disk Array capable of real-time uncompressed 2K playback can also be installed making the ExtremeStor Transport one of the most feature rich portables on the market. Take Resolve on the road with the ExtremeStor transport. Globalstor’s ExtremeStor-DI workstations and servers are designed for real-time capture and playback of un-compressed 2K, stereo 2K, un-compressed 4K, stereo 4K as well RED, Sony and other digital media types. Designed and certified for use with DaVince Resolve for Windows and DaVinci Resolve for Linux, the ExtremeStor-DI can meet the needs of the most CPU, GPU and disk intensive requirements. Featuring integrated SSD or magnetic disk arrays with capacities up to 144TB and read/write speeds up to 4000MB/Sec, the ExtremeStor-DI workstations and servers will bring out the best in your Resolve workflow with minimal upfront investment. Globalstor’s ExtremeStor PCIe Expansion Systems allow DaVince Resolve users to expand one host x16 Gen2 PCI Express slot to an expansion chassis with up to five additional PCI Express Gen2 slot. The expansion chassis’ non-blocking eighty lane PCI Express Gen2 switch enables the coupling of cost-effective host PCs and servers with high bandwidth, peer-to-peer capable I/O subsystems. Plug and play architecture allows users to expand their I/O capabilities regardless of their operating system or platform. Support for Windows, MAC, Linux as well as other operating systems is standard. With optional integrated RAID and capacities up to 144TB, ExtremeStor Expansion systems are the ideal solution for DaVince Resolve and support uncompressed 2K, Stereo 2K and even 4K playback while also allowing use of multiple GPU’s, Red Rocket Cards, Fibre HBA’s or virtually any other PCIe card.